Posted by Derek Hughes on 16th November 2018. This cocktail was invented by Hgiam Tong. It was a boom for the Raffles Hotel Bar in Singapore between 1910-1915. There have been several recipes since Raffles designed the cocktail, but they will not reveal the original recipe to anyone. In fact the recipe is kept under lock and key! To make this cocktail, you will need to pour the Gin, Cherry Brandy and Cointreau (3 x ingredients = 50ml) with the lime juice (25ml), roughly about a third of the way up, inside the cocktail shaker. with a few of the ice cubes. Then give the cocktail a good mix by giving it a good shake. Strain and pour the drink into the glass over some ice cubes. 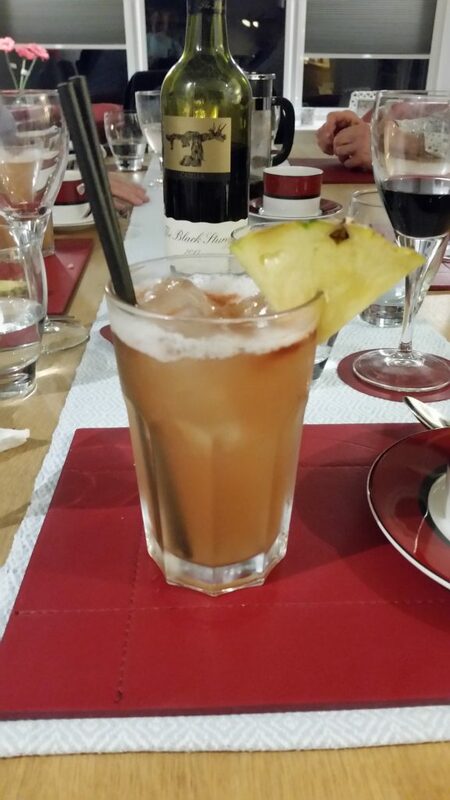 Finally, garnish with a slice of fresh pineapple on the side of the glass and pour a couple of drops of Angostura Bitters over the ‘head’ of the cocktail. Relax and enjoy!